In 2013, the Papua New Guinean Government launched PNG’s National Financial Inclusion & Financial Literacy Strategy 2014-2015 (NFIFLS). This was the nation’s first plan to tackle the problem of poor access to financial services facing the majority of Papua New Guineans. As the peak industry body, CEFI plays a pivotal part in coordinating the strategy’s rollout. We work closely with the Bank of Papua New Guinea and key stakeholders including government, financial service providers, development partners and the six industry working groups. Through collaborative planning, regular meetings and the technical support of each working group, CEFI is able to guide and monitor the strategy’s progress to ensure it reaches its objectives. 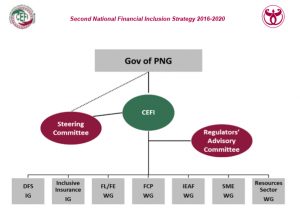 Six working groups (WG) was established to coordinate all financial inclusion (FI) activities and agendas and ultimately achieve objectives outline in the 1st National Financial Inclusion Strategy (NFIS) of Papua New Guinea. The first NFIS was developed for 2015 and 2016 only and each WG faced varying levels of challenges and obstacles however the overall outcome of the strategy exceeded its targets. Due to capacity issues in CEFI, the coordination of the WGs was mainly handled by the Bank of Papua New Guinea (BPNG) especially in scheduling meetings and the planning of other FI related activities. These WGs comprised of representatives from commercial banks, microbanks, insurance companies, savings and loans societies, regulators, mobile network operators and various government departments. All the WGs have elected their respective chairman who oversee their discussions and progress. This working group served as a coordinating body for consumer protection and market conduct initiatives mainly to coordinate with other industry bodies such as Independent Consumer and Competition Commission (ICCC) and other regulators to work on globally accepted best practice consumer protection policies, standards/guidelines to protect vulnerable users of financial services for PNG financial consumers. The formation of this working group was to oversee the implementation of the financial literacy activities via partnership and/ or coordination with the Department of Education specifically to facilitate actions to introduce financial education into the existing school curriculum as well as effectively promote standards/modules for the delivery of financial literacy and financial education trainings in PNG. This working group was established to focus on innovative ways to expand access and encourage markets using the mode of Information and Communication Technology (ICT). Also it was tasked to facilitate the development of reliable and user friendly payment systems platform to serve the low-income population sustainably in order to reduce the time and money that low income earning people spend to conduct financial transactions. The data measurement working group was established to encourage and promote the importance of collecting and sharing of pertinent data to measure progress in Financial Inclusion. The member of this group are to work closely with the National Statistics Office, Credit Data Bureau, CEFI and the Bank of PNG to help institutionalize a standard set of indicators that will be collected on quarterly basis. This working group is responsible for formulation of the Core Financial Inclusion Data Reporting Template for data collection, and ensure active involvement in sharing data and to highlight gaps in outreach and services through digital mapping and other effective mediums of data presentations. This working group was created to promote in the development of a conducive policy framework and regulatory environment for the growth of the inclusive insurance market. It was tasked to coordinate and form partnership between government and the private sector for offering relevant products to the poor; including the use of alternate channels for distribution. Establishment of this working group was to ensure that the various government departments activities related to financial inclusion are coordinated and complimentary, with the overall goal of decentralizing delivery of financial services, financial education, and financial awareness for low income consumers and MSMEs. CEFI is now working with key stakeholders towards the implementation of the National Financial Inclusion Policy, aligning with the ‘2nd National Strategy on Financial Inclusion 2016-2020’. The aim of the national strategy is to have a clear road map and bring together initiatives from public sector, financial and non-financial institutions and other stakeholders such as donors to expand financial inclusion in PNG. In particular, the national strategy articulates action for the provision of financial products and services to reach an additional 2 million unbanked and underserved people across the country, 50% of whom will be women, within the next four years. This is also in line with PNG’s global commitment to the Maya Declaration and focus on addressing financial inclusion in a more coordinated and holistic manner.